Laphroaig ends the year on a high note with the release of its 27-year-old single malt. This expression is the latest entry in the brand’s Super Premium series, following exquisite 32-year-old and 30-year-old whiskies, released in 2015 and 2016, respectively. For this 2017 release, whiskies matured in refill hogsheads were transferred to first-fill ex-bourbon barrels and refill quarter casks. After more than a quarter century of maturation, Laphroaig 27-year-old is bottled at 83.4 proof, or 41.7 ABV. It would be safe to assume this is cask strength given its random proof. The whisky carries rich aromas of tropical fruit, leather, peat, citrus, and vanilla. On entry, vanilla cream develops into key lime pie, tobacco leaf, and tropical fruit punch. Hints of earthy peat and smoke begin gently piercing though but don’t overpower the other flavors. Of note is the whisky’s oily mouthfeel, which coats the palate in flavor. Though Laphroaig 27-year-old is a low 83.4 proof, it doesn’t present itself as thin or watered down. The finish is long and slightly warming with a citrus-tinged smoky character. Every year, Laphroaig releases a different expression under their Cairdeas (gaelic for friendship) umbrella. 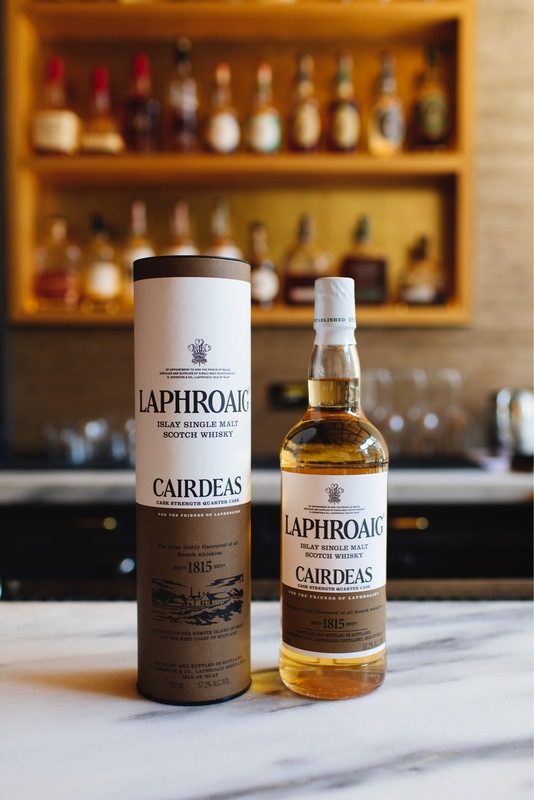 The 2017 edition is a cask strength version of Laphroaig Quarter Cask. The 57.2% abv whisky started with a 5-year plus maturation in first-fill bourbon barrels, followed by a six month secondary maturation in quarter casks. The resulting whisky features no added color and is not chill filtered. The nose is full of that signature Laphroaig funky Islay peat, as well as vanilla and tropical fruit. It’s a touch more closed off at cask strength, but opens up with a splash of water, which brings about more of the fruity notes. On the palate, it’s slighlty less sweet than the standard Quarter Cask, but packed with flavor. Toffee, brine, and tropical fruits, especially mangos, define the whisky as much as the whallop of ashy smoke in the background. Some young oak and herbal notes appear on the backend. The finish is long and complex, featuring notes of vanilla cream, spice and smoke. Thanks to Beam Suntory for the sample. As always, all thoughts and opinions are my own.